The Revenue Marketing Series is a compilation of thought leadership and success stories from Integrate’s customers, organized into guides for enterprise marketing leaders who are exploring new ways to scale revenue. 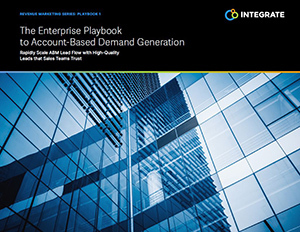 This playbook focuses on executing a scalable ABM strategy, which is just one of many demand generation strategies to consider and integrate. Get your copy of the playbook now!